It’s no secret that Americans do everything-and-the-kitchen-sink box stores well. And it’s also no secret the French don’t do box stores, period. So while you’re settling into the expat lifestyle you might need some help getting over the loss of every American’s one true love, Target. In need of a new casserole dish? A suitcase? Some curtains? Look no further than the storied aisles of everyone’s favorite bullseye department store, Target (Tarjay?). Its merchandise is ripe for the buying! It’s sale offers are unparalleled! You might even find a Starbucks inside! Oh wait, we’re in France. Target is one of the States’ not-so-best-kept secrets. Everyone knows it, most people love it, and if you’re an American who’s recently taken the plunge into expat life here in our little city you probably really, really miss it. If you ever don’t know where to find something, chances are Target has it. From clothes and beauty products to electronics and grocery shopping, this paragon of the American consumer scene is the go-to for, well, everything. But France isn’t quite so on-board with the American need to have every product imaginable within a 10-aisle radius. Department stores aren’t common, and it can be hard to figure out where to buy simple things like water bottles, nail clippers, and other household necessities. Truth be told, we can’t promise you a Target-equivalent in Lyon. However, we can direct you towards a few stores that have made our lives quite a bit easier when we’re in a jam and just really need that yellow thread so we can restitch the shirt that ripped on the way to work. So without further ado, we now present to you: how to recreate Target in five stores or less, in no particular order. In addition to all its other gizmos and gadgets, Target is a great place for those last-minute cards and wrapping paper, with a side of that terrarium you’ve been eyeing since HGTV said you just had to have it. Filling that role here is Hema, but the one on Rue de la République, not the one at Part Dieu. Never the one at Part Dieu. Promise? Hema on Rue de la République is a perfect place to grab some gift tags and a cheap laundry basket while getting distracted by the seasonal décor placed strategically by the entryway. Their home furnishings are usually a sea of rose gold and matte pastels, and most things cost under €10. Welcome to your new favorite drugstore. If you’ve had any reason to hit a pharmacy in Lyon, you’ve probably noticed the small ones are often a disappointment. It might work for some ibuprofen tablets, but if you’re looking for a Target-worthy health and personal care section it’s time to bring out the big guns. 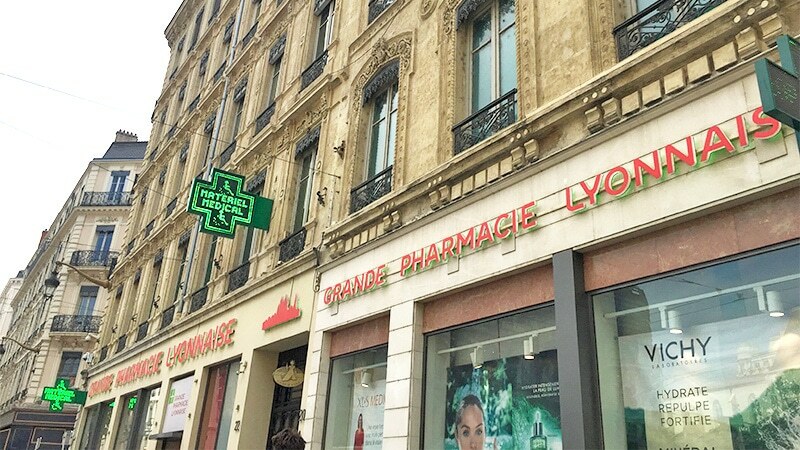 The Grande Pharmacie Lyonnaise is the only drugstore in Lyon you need in your life. Grande Pharmacie Lyonnaise delivers on everything from nail polish to essential oils to a whole wall of toothpaste. It’s also home to a really big actual pharmacy with trained pharmacists and helpful students who genuinely want you to feel better. In an added bonus, it’s the one place we know of where you can get eye drops that come in bottles instead of the silly one-time-use capsules. We’ll see all you fellow allergy sufferers in the eye care aisle. 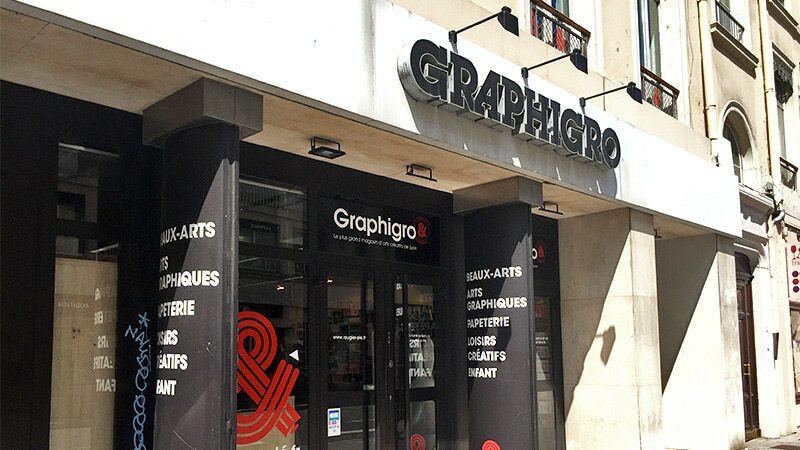 Graphigro is a Lyon DIY-er’s best friend. From scrapbook materials to colorful feathers, it’s a craft store that’s also Lyon’s answer to Target’s school and office supplies. Graphigro has tons of beautiful notebooks – college ruled, not the graph paper French notebooks are so fond of. We never thought we’d be so grateful to live in a college-ruled world. Upstairs there’s also various types and sizes of paper, mailing supplies, and even twine for, well, whatever it is you do with twine. Downstairs is the paint and crafting section, with said colorful feathers alongside 3D stickers and sewing supplies. Graphigro is an arts and crafting store that also has useful household items like mailing envelopes, notebooks, and picture frames. Bazaar (n), /bəˈzɑːr/ : a store in which many kinds of goods are offered for sale. Look at Dictionary.com hitting the nail on the head. They may have dropped the third a, but Maxi Bazar is exactly what it sounds like. It’s basically the Target home goods section with a touch of cosmetics and candy thrown in. Lamps, dishes, patio furniture, if it’s decorative and goes in your home, you can find it here. As an added bonus, it’s the one store in the city that goes all out for Christmas, taking advantage of the glass cathedral ceiling to install all the fake Christmas trees you could ask for. And now, for the mother of all fake Targets: Carrefour. 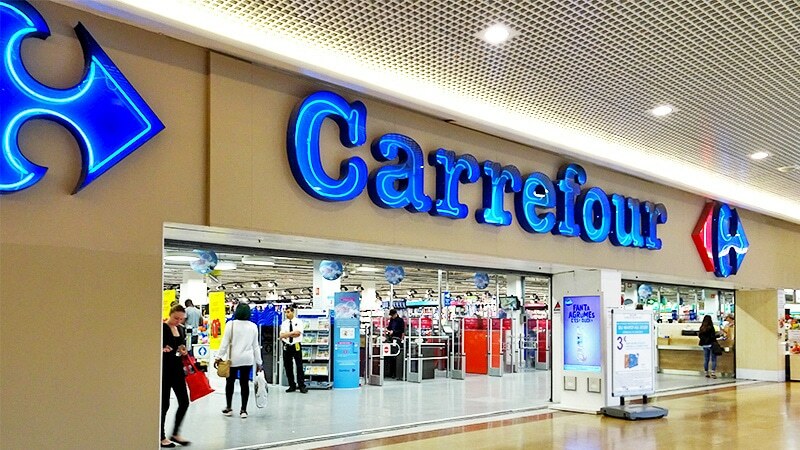 But not just any Carrefour. We’re talking about the giant Carrefour that sits on level two (read level three for all those struggling with the French numeral system) of the Part Dieu shopping center. The giant Carrefour at the Part Dieu shopping center nearly makes up for France’s lack of Targets. This is without a doubt the closest you’ll ever get to an actual Target here, and we have to say it doesn’t leave much to be desired except perhaps a certain miniature bull terrier mascot. This “hypermarché” lives up to the name, with departments for electronics, beauty, food, clothes, home goods, kitchen appliances, garden necessities, and even an entire aisle dedicated to every bag of candy you could want to rot your teeth with. With the exception of the giant Carrefour, all of these stores are located on and around Rue de la République in Lyon 2 for an ideal product-to-distance-traveled ratio. Walking between all of them you’ve just about covered the space from the grocery section to the kids toys in your favorite old Target. Still looking for something? There actually are a few big box stores farther away, including IKEA and Auchan by St-Priest (accessible by T2). They each have their merits, particularly if you’re looking for cheap furniture and appliances. There’s also the Carrefour Planet in Ecully if you’re looking for an even bigger Carrefour experience. But wait! What about the clothes? Oh, yes, you may have noticed we left the clothes section of Target off this list. Thankfully, clothing stores is the one thing that Lyon has in full supply. It’s a much bigger struggle to find the right lightbulb than it is to find a cheap hoodie. However, if you’re really stumped, try New Look, Bershka, or Primark in the mall. Alright! You’re ready! Grab your wallet, map, and a reusable bag (this is still France, after all) and head out to finally cross some things off that to do list (we see you, fellow procrastinators).